Murky Memories: It was the year after the Astro’s came 1 inning away from going to the World Series (giving up that spot to the Amazin’ Mets). Nolan Ryan was recovering from injuries that had him on a strict pitch count. As a result, he did not pitch a single complete game, despite leading the National league in strike outs, ERA, and having been taking out of the game three times with a shut-out in progress. The most frustrating part for me, was that in 34 starts, Ryan only earned 8 wins. 16 times, despite his league leading ERA, the Astros failed give him enough run support, and on 10 occasions Ryan earned a no decision despite pitching extraordinarily well. Many of those L’s and ND’s came as a result of his bullpenn giving up a game he had won for them. 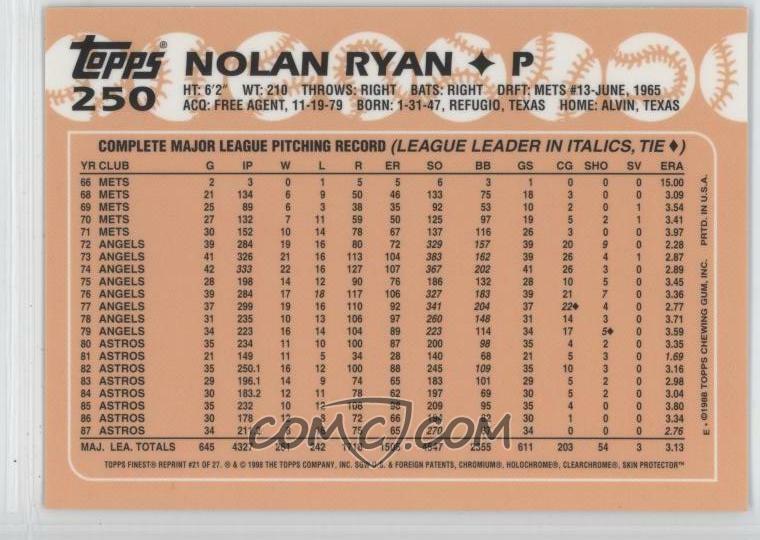 And it frustrates me that when people look at Nolan Ryan’s career stats, they don’t take into account the effect that sort of thing has on his overall winning percentage. None the less, it was a great season to root for Ryan – from what I can remember of it.